We had a lot of snow dump all at once a couple weeks ago. It’s been a ridiculously warm winter for here in central Colorado, but I’m not complaining too much. Snow can be fun to play in, especially if you are a Pixie or a Matti, but I’m not a fan of driving in it. Or of paying for heat*. We got about a foot of snow over about a day, so the next day everyone got to play in it. Pixie had a great time, almost as good as playing with bubbles, though she had a bit of difficulty getting around in the snow. She has bilateral hip dislocation (she was born with her legs out of the sockets), so motoring around is hard enough as it is. 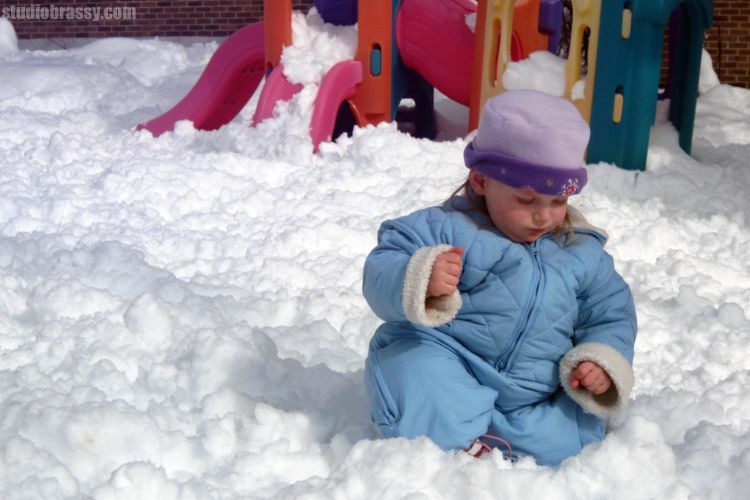 Add in lots of snow and a snowsuit that made my tiny girl look like a beach ball, and she tired out pretty fast! She also refused to wear her gloves, since she wanted to eat the snow without extra fuzzies. Don’t worry. Daddy warned her not to eat the yellow snow. *When I’m feeling particularly reckless, I turn the heat up to 65 F!